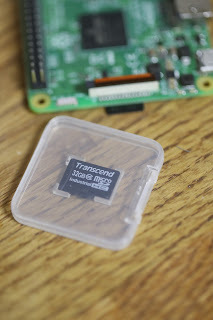 There is a handy shortcut to getting ssh control of a new, headless RaspberryPi ... after making the new SD card image you can 'touch /boot/ssh'. If /boot/ssh file (with no or any contents) exists at boot, sshd will be enabled when the Pi boots. Isn’t that exactly what is said? Yes, I see what you mean now, D'Oh. It's been a while since I played with my RPi but if the number of write-cycles bothers you there's always the rasberrypi version of Tiny Core Linux, http://forum.tinycorelinux.net/index.php?board=57.0. IIRC after booting it doesn't touch the SD card. You can also create your own distro with the apps you want to create an embedded device. An example of this is PiCorePlayer, https://sites.google.com/site/picoreplayer/home. There's also a community of bare metal programmers for the RPi which I've dabbled with myself, https://github.com/dwelch67/raspberrypi. However not all specs are made available and this has been a source of consternation between the programmers and the RPi foundation. you can also use 'losetup' to attach an image as a partitioned disk - so that you get a bunch of devices appearing, one for the disk and one for each partition. Use losetup --partscan and then mount the individual partitions. Similarly, there's kpartx which will make your disk image behave like a normal disk, enabling you to mount partitions without manually sorting out offsets and what have you. Which is exacttly what losetup does. kpartx really works at a level above losetup. will create /dev/dm-* files for each partition and lvm volume group it finds. These can then simply be mounted etc. We prefer running Debian (Sjoerd Simons, Collabora) rather than Raspbian, since at least in the early days grafting KDE onto it with decent large-screen support was a problem. You'll always need a small Raspbian filesystem at the start so that you can get low-level firmware updates, their pukka kernel, and the all-important vcgencmd program and support libraries. xl2tpd runs fairly well but you need to compile it to not use kernel facilities. I passed that on to your support people a year or so ago but it never got to the relevant bit on your website. It's usually not the actual SD-card that breaks, brownouts and violent shutdowns seem to make the Pi write garbage to the card, effectively corrupting the filesystem.